Mathematics plays a key role in the development of a students’ numeracy which assists learning in other areas. Merredin College aims to foster students’ mathematical interests, talents and creative development through an interesting and challenging curriculum in an environment that supports the pursuit of excellence. With a focus on assisting each student to do their best, we deliver regular help both in and out of classes for students at all stages. The Merredin College Mathematics program enables students to read, write and speak the language of Mathematics in a variety of contexts and forms so that they can understand and convey mathematical ideas, interpret text containing mathematical forms, and continue to use and learn Mathematics autonomously outside the school setting. All classes in Kindergarten – Year 2 have a dedicated Numeracy Block for explicitly teaching numeracy skills. The curriculum focuses on number skills, measurement and geometry. Students from Pre-primary onward are subscribed to Mathletics which is accessed in class and available for home use. We have a sequenced Mental Mathematics Skills’ program which is incorporated into daily lessons and students use the Targeting Maths book and iPad App to support their classroom program. 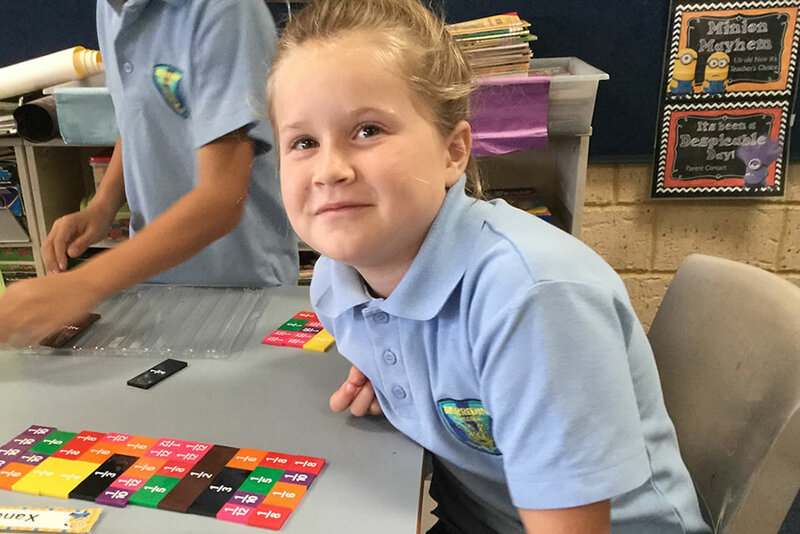 All classes in Year 3 – Year 6 have a dedicated Numeracy Block for explicitly teaching numeracy skills. The curriculum focuses on number skills; measurement; chance and data; and geometry. Students are subscribed to Mathletics which is accessed in class and available for home use. Lower school students study the Western Australian Curriculum. All the Year 7, 8, 9 and 10 Mathematics classes at Merredin College are streamed. We aim to cater for the individual needs of all students and streaming ensures most students in a class are working on similar tasks. This will provide students with more opportunities to work collaboratively and allow more whole class activities. Merredin College also offers Mathematics’ Extension classes once a week to selected students from each of Years 7, 8, 9 and 10. The emphasis is on problem solving and preparing the students for higher order Mathematics subjects in upper school. Each course consists of four units. Units 1 and Units 2 are taken in Year 11 and Units 3 and Units 4 are taken in Year 12. The courses are differentiated, each focusing on a pathway that will meet the learning needs of a particular group of students. Recommended for students who have been successful in Year 10 (high C or better). This course has a different focus to Methods but still requires a strong commitment to demonstrate understanding and study. This is a prerequisite for many university courses and desirable by most. Recommended for strong mathematics’ students who have excellent algebra skills. Students should have achieved at least a high B in Year 10 Mathematics. Universities list Mathematics Methods as a prerequisite for engineering, mathematics and some science courses. This course attracts a 10% bonus on the scaled score used in the ATAR calculation. This course is recommended for excellent mathematics’ students who want to work beyond Mathematics Methods to develop mathematical arguments and proofs. It is recommended for students who have achieve an A grade for Year 10 Mathematics. The course attracts a 10% bonus on the scaled score used in the ATAR calculation. Recommended for students who are not university bound but have achieved at least Numeracy Category 2 for OLNA in Year 10. This course has a heavy focus on solving problems in real contexts to prepare students for further training or employment. Only students who are in Numeracy Category 1 for the Online Literacy and Numeracy Assessment (OLNA) are recommended to enrol in this course; however students who are in Numeracy Category 2 for OLNA are also permitted to enrol. This course builds student capacity to meet the numeracy standard for the Western Australian Certificate of Education (WACE) which is defined as a pass in OLNA Numeracy (achievement of Category 3).